For other uses, see Mephistopheles (disambiguation). Mephistopheles flying over Wittenberg, in a lithograph by Eugène Delacroix. Mephistopheles (/ˌmɛfɪˈstɒfɪˌliːz/, German pronunciation: [mefɪˈstoːfɛlɛs]; also Mephistophilus, Mephostopheles, Mephistophilis, Mephisto, Mephastophilis, and other variants) is a demon featured in German folklore. He originally appeared in literature as the demon in the Faust legend, and he has since appeared in other works as a stock character (see: Mephistopheles in popular culture). MEPHISTO_PHILES in the 1527 Praxis Magia Faustiana, attributed to Faust. The name Mephistopheles is associated with the Faust legend of a scholar, based on the historical Johann Georg Faust. In the legend, Faust makes a deal with the devil at the price of his soul, Mephistopheles acting as the devil's agent. The name appears in the late 16th century Faust chapbooks. 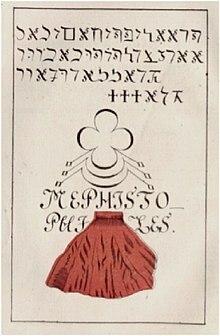 In the 1725 version, which Goethe read, Mephostophiles is a devil in the form of a greyfriar summoned by Faust in a wood outside Wittenberg. From the chapbooks, the name entered Faustian literature. Many authors have used it, from Christopher Marlowe to Goethe. In the 1616 edition of The Tragical History of Doctor Faustus, Mephostophiles became Mephistophilis. Mephistopheles in later treatments of the Faust material frequently figures as a title character: in Meyer Lutz' Mephistopheles, or Faust and Marguerite (1855), Arrigo Boito's Mefistofele (1868), Klaus Mann's Mephisto, and Franz Liszt's Mephisto Waltzes. Mephistopheles by Mark Antokolski, 1884. Although Mephistopheles appears to Faustus as a demon – a worker for Lucifer – critics claim that he does not search for men to corrupt, but comes to serve and ultimately collect the souls of those who are already damned. Farnham explains, "Nor does Mephistophiles first appear to Faustus as a devil who walks up and down on earth to tempt and corrupt any man encountered. He appears because he senses in Faustus' magical summons that Faustus is already corrupt, that indeed he is already 'in danger to be damned'." Mephistopheles is already trapped in his own Hell by serving the devil. He warns Faustus of the choice he is making by "selling his soul" to the devil: "Mephistophilis, an agent of Lucifer, appears and at first advises Faust not to forgo the promise of heaven to pursue his goals". Farnham adds to his theory, "...[Faustus] enters an ever-present private hell like that of Mephistophiles". 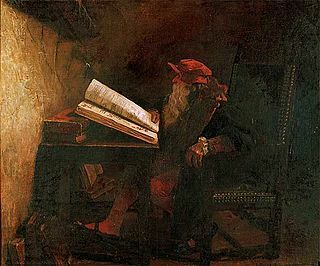 Shakespeare mentions "Mephistophilus" in the Merry Wives of Windsor (Act I, Scene I, line 128), and by the 17th century the name became independent of the Faust legend. According to Burton Russell, "That the name is a purely modern invention of uncertain origins makes it an elegant symbol of the modern Devil with his many novel and diverse forms." 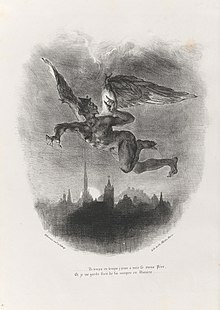 Mephistopheles is also featured as the lead antagonist in Goethe's Faust, and in the unpublished scenarios for Walpurgis Night he and Satan appear as two separate characters. Russell, Jeffrey Burton (1986). Mephistopheles: The Devil in the Modern World (1990 reprint ed.). Ithaca, New York: Cornell. ISBN 978-0-8014-9718-6. 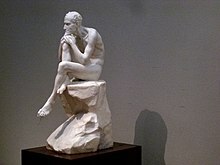 Goethe, Johann Wolfgang Von (2001). Hamlin, Cyrus (ed.). Faust: A Tragedy ; Interpretive Notes, Contexts, Modern Criticism (Norton critical ed.). New York, New York: W. W. Norton & Company. ISBN 978-0-393-97282-5. ^ Online Etymology Dictionary. "Mephistopheles". Dictionary.com. Retrieved December 11, 2015. ^ Farnham, Willard. Twentieth Century Interpretations of Doctor Faustus. New Jersey: Prentice-Hall, Inc.,1969: 6. Look up Mephistophelean in Wiktionary, the free dictionary. 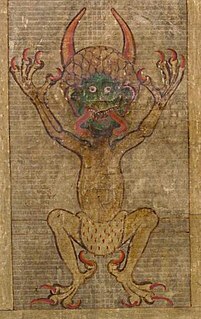 Wikisource has the text of the 1911 Encyclopædia Britannica article Mephistopheles. Faust is the protagonist of a classic German legend, based on the historical Johann Georg Faust. The Tragical History of the Life and Death of Doctor Faustus, commonly referred to simply as Doctor Faustus, is an Elizabethan tragedy by Christopher Marlowe, based on German stories about the title character Faust. It was written sometime between 1589 and 1592, and might have been performed between 1592 and Marlowe's death in 1593. Two different versions of the play were published in the Jacobean era, several years later. Faust is a tragic play in two parts by Johann Wolfgang von Goethe, usually known in English as Faust, Part One and Faust, Part Two. Although rarely staged in its entirety, it is the play with the largest audience numbers on German-language stages. Faust is considered by many to be Goethe's magnum opus and the greatest work of German literature. Mephisto is a fictional character appearing in American comic books published by Marvel Comics. The character first appears in The Silver Surfer #3 and was introduced in the Marvel universe by Stan Lee and John Buscema, based on Mephistopheles – a demon character from the Faust legend, who often went by Mephisto as a nickname. Johann Georg Faust, also known in English as John Faustus, was an itinerant alchemist, astrologer and magician of the German Renaissance. Faust: The Second Part of the Tragedy, is the second part of the tragic play Faust by Johann Wolfgang von Goethe. It was published in 1832, the year of Goethe's death. Because of the complexity of its form and content, it is usually not read in German schools, although the first part commonly is. Faust is a 1994 film directed by Jan Švankmajer. It merges live-action footage with stop-motion animation and includes puppetry and claymation. The film was produced by Jaromír Kallista and the title character is played by Petr Čepek. The film does not relate the legend of Faustus accurately according to the original, instead borrowing and blending elements from the story as told by Goethe and Christopher Marlowe with traditional folk renditions. It has elements of Modernism and Absurdism, and has a Kafkaesque atmosphere, enhanced by being set in Prague, and the tone is dark but humorous. The voices in the English version were provided by Andrew Sachs. The film was selected as the Czech entry for the Best Foreign Language Film at the 67th Academy Awards, but was not accepted as a nominee. A deal with the devil is a cultural motif, best exemplified by the legend of Faust and the figure of Mephistopheles, as well as being elemental to many Christian traditions. According to traditional Christian belief about witchcraft, the pact is between a person and Satan or a lesser demon. The person offers their soul in exchange for diabolical favours. Those favours vary by the tale, but tend to include youth, knowledge, wealth, fame, or power. Doctor Faustus is a 1967 film adaptation of the 1588 Christopher Marlowe play The Tragical History of Doctor Faustus directed by Richard Burton and Nevill Coghill. The first theatrical film version of a Marlowe play, it was the only film directed by Burton or Coghill, Burton's mentor. It starred Burton as the title character Faustus. Elizabeth Taylor made a silent cameo appearance as Helen of Troy. The film is a permanent record of a stage production that Burton starred in and staged with Coghill at the Oxford University Dramatic Society in 1966. Burton wouldn't appear onstage again until he took over the role of Martin Dysart in Equus on Broadway ten years later. Historia von D. Johann Fausten is an opera by the Russian composer Alfred Schnittke (1934–1998) in three acts, with introduction and epilogue to the German libretto by Jörg Morgener and Alfred Schnittke after the anonymous prose book of the same name. Johann Spies was a German printer who published an anonymous book of tales about a legendary Doctor Faust who made a pact with the Devil. The story became the basis for several notable literary works, including Marlowe's Tragedy of Doctor Faustus and Goethe's Faust. The idea of making a deal with the devil has appeared many times in works of popular culture. Soul Cartel is a Korean manhwa series written by Kim Eun-hyo and illustrated by Kim Yeong-ji. Started on 2012, this webtoon manhwa was released on Naver Webtoon and its final raw chapter was published on April 6, 2016.